Well we finally extracted ourselves from Streaky Bay. Leaving was made much harder, not only because of the beautiful view but because of all the great people in the park especially Ken and Sue who were camped opposite us. They were not only good company but also spoilt us by giving us fish, razor fish and calamari that they had caught. Sue even cooked some for us and bought it over. The world is full of lovely people. First stop was Ceduna to get the car checked out. The smoke from last week was narrowed down to the handbrake assembly caused by me leaving the handbrake on. Silly billy!! Was glad to find out what the problem was before the big trek to the west. Our first overnight stop was Cactus Beach, just north of Penong. This beach is world renowned as a surf beach with both left and right hand breaks. Had it not been blowing 50 knots and drizzling it would have been a lovely spot for a few days. The camp is on private property and has basic amenities and only $10-00 a night. On the way to the camp you drive past these amazing pink salt lakes. It was like being on another planet. The coast line around here is some of the most impressive and rugged we have seen yet. Cactus was only to be a one nighter mainly due to the weather and because we were keen to start the journey over the Nullarbor. Just after setting up I noticed one of the van tyres going flat in front of my eyes. Luckily Tim (we met up with Tim, Katie and the kids here) had a tyre plug repair kit (which neither of us knew how to use) but which I did use successfully. I will get the tyre checked in Norseman. Next morning back to Penong for more fuel then off we went. Now the road from Penong to Norseman which is commonly known as the Nullarbor is 1160 km long. Of this only 186kms is actually the Nullarbor stretch. But for now we won't split hairs and will call the whole thing the Nullarbor. So what did we expect? A boring, straight flat road with lots of sand and no trees. We also thought we would be run off the road by thousands of road trains and need to carry enough supplies and water to feed a small army. The Nullarbor is long but anything but boring. In fact it is the complete opposite to everything that we expected. I would go as far as saying it was one of the most interesting drives we have done. I have never seen landscape change so rapidly. Firstly it is very hilly, and for the first couple of hundred kms it was up one hill and down the next at least 500 times. It was really green due to recent rains, although the small dams along the road were very dry. The landscape went from low salt bushes to lots of fairly large trees to absolutely nothing every time you blinked your eyes. This part of the world is far from boring. We saw very few trucks and in fact were only overtaken about 8 times by trucks on the whole trip. These guys seem to only drive at night and the ones we had contact with were very pleasant and professional. The roadhouses were spread out about every 100 kms and are like little towns be it a little expensive.They all have little shops that you can get most supplies including frozen bread and milk, souvenirs, good restaurants complete with a bar and motels and caravan parks attached. The dearest diesel was at the Nullarbor roadhouse at $1.70 /litre but we paid on average $1.46 /litre. They all have toilets for use and hot showers ranging in price from $1-00 to $3-50. After a few days driving and free camping these were great. Our first night on the Nullarbor was spent in one of the many free camps dotted along the road. These are well off the road with tables, shade, bins and some with basic toilets (if you could call them that). The next day was overcast, at times raining very heavily with a very strong south-easterly wind blowing. While this made for very pleasant driving conditions it did make getting to all the lookouts over the Bight a little unpleasant. Unfortunately the 'Head of the Bight' was closed due to recent hail damage!! The lookouts over Bunda Cliffs were every bit as impressive as all the photos we have seen. We were both a little nervous as there are no safety fences and the drop over the cliff is huge. (90 metres) Note the puddles of water everywhere - not everyone gets to see rain on the Nullarbor - a week ago it was 50 degrees! The next day we crossed the border and had to surrender all our fruit and vegetables at the fruit fly gate. 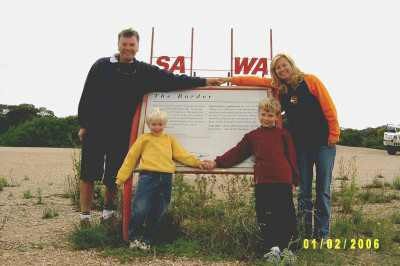 Of course we stopped at the actual border and took all the usual photos. (Note the jeans and jumpers!!) The next roadhouse/village was Eucla. This was going to be a quick detour to see the ruins of the old telegraph building but we ended up spending almost the whole day there. We did get down to see the ruins of the telegraph building then back to the roadhouse for morning tea. Nearly all the roadhouses have playgrounds with some of them being really good. We would park the van next to the playground and let the kids loose while we sat back in the luxury of the "Grand Tourer" listening to the old kettle boil and then enjoying a well earned cuppa. This roadhouse was really special. It was spotlessly clean - the best shower block we have seen in a long time. A great long hot shower with excellent water pressure for $1-00. 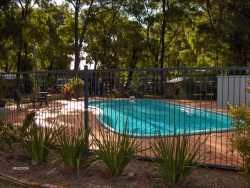 There is also a large inground pool with a sensational ocean view and beautiful gardens. The guy who owns/manages it is into frogs and has large ponds all through the gardens with literally thousands of frogs everywhere. Now this is a real oasis in the desert. Absolutely this rates as the number 1 roadhouse on the Nullarbor, followed by the Nullarbor Roadhouse. This place you have to see. Eucla also has a weather station and the guy who runs it does tours for anybody that drops in. This is a really large facility and as flash as, with one bloke working there. The office area would comfortably seat 8 people. The views over the coast were to die for. He showed us all his computers and radars and explained all about the weather balloons. They are released twice daily from this location at a cost of $200-00 each and travel to a height of 26 kms before blowing up. The balloon is about the size of an average sized house just before its demise. The information they gather from it is amazing. It still staggers me that with all this technology they still get it wrong 75% of the time and we accept that. He was a really nice bloke and was telling us they rotate the staff around to different stations every two years. He had been to islands off the QLD coast and Antarctica. Good life if you are a loner. Anyway we then did the Eucla museum and then chatted to a local lady who sent us off to the local quarry just down that dirt road over there!! Well what seemed like 30kms later on a really bad dirt road with van in tow we found it. And what were we searching for?? Fossils and plenty of them. Lovely shell impressions in lumps of rock. A little more weight. Beauty!!!!! By this stage it was mid afternoon so we didn't get too far before finding another camp on the side of the road not far from Madura, for an early dinner then off to bed. The next leg to Norseman was long with not a huge amount to see. We did intend to do this over two days but due to our very early get away we pushed on and did it in one. We arrived in Norseman around 5-00pm and put our feet up. 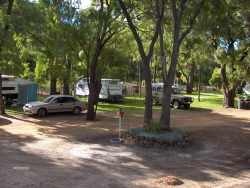 The one and only caravan park in town was very very average and the most expensive we have ever stayed at. That might have had something to do with the fact that we were the only van there. As for the rest of the town it was excellent. I took the van into the local mechanic, a young guy (like me!) who also enjoys traveling with his family. He removed the tyre that I had plugged from the rim and patched the tyre properly and balanced it, tightened up one wheel bearing and checked all the others, all for $30-00. You have to love country service. Meanwhile Chris and the boys checked out the town sights and the Tourist Info, which had free showers. Norseman is a lovely little town well worth visiting. Our only suggestion would be to free camp at a nice spot just 5km east of town and give the caravan park a big miss. Save yourself the $35-00!! Next stop 200kms down the road is Kalgoorlie. We have been told there is a lot to do so will play it by ear as to how long we stay. Now this is a much bigger place than we expected. In fact it is the biggest outback city in Australia with over 30,000 people. As soon as you get close to the city it is very obvious what keeps this place going. Almost in the middle of town is the largest open cut mine we have ever seen. This place is all about gold. The 'Super Pit' as the mine in town is known has to be seen to be believed. It is the biggest hole in the ground that you could imagine. Harry is now as busy as trying to build his own superpit next to the caravan. Despite this thing being in the middle of the place, this is a very well appointed, clean and tidy city. It looks like we will be here for close to a week to see all the things on offer. There are 6 caravan parks in town and after checking them all out we settled on the Top Tourist, Kalgoorlie Accomodation Park. It's very nice with a great pool and playground. Nothing else really matters. Staying in the same park are two families we have met previously. Mick and Kaz we met in Streaky Bay and the others in Port Lincoln. It's kinda nice bumping into familiar faces. Unfortunately Mick and Kaz had to leave to be back home in Perth by Sunday night. Both them and us wanted to do the brothel tour so we looked after their kids while they went and they looked after ours. This working establishment was amazing. The tour was worth every cent of the $35-00 per person. This really is a very classy establishment with an incredible collection of art and sports memorabilia. There must be plenty of money in this industry. Maybe I should buy a brothel and not a post office!!! We certainly found out all the ins and outs (excuse the pun) of the whole industry and the girl who conducted the tour (who we think was a working girl in the past-very distant past) was willing to answer any questions we asked. It was good because we had two other young couples on our tour as well, so it wasn't all me asking all the dopey questions. The tour was well worth it and took over an hour and a half. If you are up this way put it on your 'to do' list. The next tourist attraction was the 'Super Pit'. As I said earlier this really is massive. It works 24/7 all year round . The big dump trucks looked like little ants and were everywhere. Each truck carries 225 tonnes of dirt and from each truck load they extract about one golf ball size amount of gold. In this mine they extract about 21.4 tonnes of gold per year. The pit is the largest open cut gold mine in Australia and is 3.8km long, 1.35 km wide and more than 500 metres deep. It has a remaining life of 14 years. Harry will be digging for a while to beat that. Most days at 1-00pm they do a 'blast'. 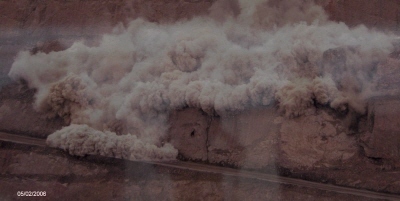 The blast is often cancelled due to the wind (they don't want to cover the city in dust) and depending on which part of the mine is being blasted determines on how spectacular it is from the viewing platform. We were there for one of the blasts and a bit like me, it made the earth move!!! There is so much work around here its not funny. A young guy we met in Port Lincoln, who is staying here asked at the employment agency and was given a job on the spot, with absolutely no experience, as a TA and took home over $600-00 for 2 days work. And what did he do? He stood and watched 2 guys who were working in a hole 4 feet deep, to make sure they were safe. If a problem arose(!!!) he had to ring a bell. He said he was very bored but well paid. He can get as much work as he wants. The company also picks him up, takes him to work and drops him home all for free and he is paid for that traveling time. Bugger the Post Office and Brothel, I might work here. Tuesday was spent at the 'Miners Hall of Fame'. This place is really great. It's like walking into a mining town at the turn of the century. Plenty of old buildings and mining equipment gives it a very authentic feel. We went underground again but this time only 132 feet to an elaborate labyrinth of tunnels. It was very similar to Broken Hill but still very enjoyable. Next we went to see a gold pouring demonstration. 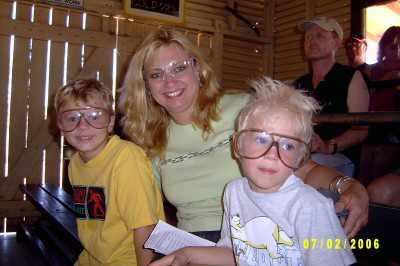 As you can see from the photo below we all had to wear protective glasses. What a sight!! The gold was heated to 1200 degrees celcius in large gas fired ovens. At that heat it still took 30 minutes for the gold to become liquid. The small ingot that had just been poured was then passed around. As expected it was very heavy and 'doing a runner' did enter my mind. Probably would have dropped it and broken my foot! A tonne of gold is only about the size of a beer carton. That surprised us. Current price for a troy ounce (31.16grams) of gold is $770. 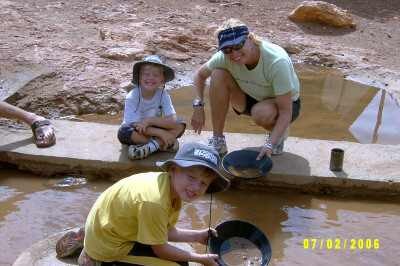 Now that we had 'Gold Fever' it was off to do some gold panning. It looks like permanent retirement will have to be postponed as our success was but small. A part of the same complex is a very modern 3 story building housing more interactive information about the history of mining. There is a computerised interactive area for kids which was a real hit with the boys. At only $60-00 for the family this was great value and a really enjoyable full day out. Wednesday after a visit to the local and somewhat famous 'Lolly Shop' and a few lookouts we spent a bit of time catching up on a few jobs. 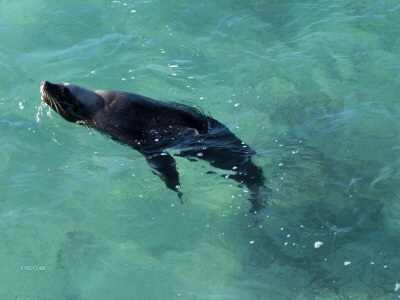 Later this week we will start making our way down to Esperance with our first stop being 'Cape Le Grand National Park'. We will meet up with Tim, Katie and the kids there which will be fun. We debated after getting to Norseman whether or not to even come to Kalgoorlie. We are all glad we did as this is a lovely town with a lot to offer. If you are traveling to the west make sure you put this on your 'must visit' list. Well it's now only the 8th of the month and look how much we have done. Looks like we will have a busy month ahead of us. The trip from Kalgoorlie to Esperance was uneventful. We only intended to drop into Esperance and visit the Tourist Info centre, get some fuel and head off to 'Lucky Bay' in the Cape La Grand National Park. We will stay in Esperance and check it out after Cape Le Grand. This national park is one that was continually mentioned by people when we spoke about WA. Dave and Marg loved it on their visit last year, as did the Joiners so it was on our 'must visit' list. While we were at the information centre we bumped into Tim, Katie and the kids who we had planned to meet up with again at Cape Le Grand. There are two ways to get to the National Park. One is via the bitumen road (about 60 km) and the other along the beach which is about 30km shorter. The beach for some is the preferred route but has of late been a little soft and boggy. Tim and Katie planned to go via the beach route. We of course took the longer route. Well, we knew that this was a popular spot but didn't expect it to be quite so busy. There were literally no spots left (although we did squash in between two vans for the night) and NO Tim and Katie. Chris was a little worried about them but my explanation was that they had arrived here and seen how packed it was and moved to the other camp ground. I thought we would catch up with them the next day. What could possibly have gone wrong that Tim couldn't handle?? Well at about 7-00pm that night in they rock. The poor buggers had been stuck in the sand on an incoming tide with the water only 3 feet from the car and trailer. Now Tim is a Mr Gadget and was using every toy he had to extract himself from a very possible watery grave. Katie got on the UHF radio and was calling for help as no other cars were around (I wonder why). Luckily for them a young guy in Esperance heard her pleas for help and came to the rescue. Yet another example of 'Human Nature at it's best'. The good news is that 3 1/2 hours later they did get out and no damage done. And what was I doing while they were in trouble? Sitting around having a coffee. So here we are. 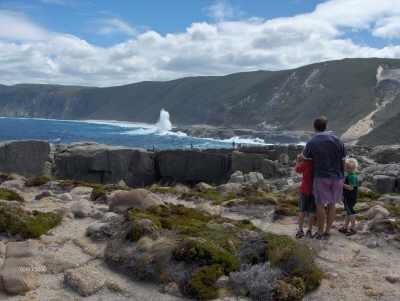 The famous Cape Le Grand National Park. 'Beautiful' does not do this place justice. It truly is amazing. The whitest of white silica sand and the most turquoise of water combined with small secluded bays is absolutely picture perfect. To our surprise it actually looks better than in the tourist brochures complete with kangaroos lying on the beach. This area consists of 5 separate bays all within a few kms. Lucky Bay (pictured above) is where we are camped and is one of the largest. The camping area is very civilised with an on- site Ranger, flushing toilets, hot showers, drinkable water, camp kitchen and picnic tables. You are even allowed to run the generator between certain hours. All this and a view to die for, for $14.50 per night. When we lobbed in the other night we didn't realise we had camped amongst a group of 6 'Grey Nomad' families who come here from Fremantle each year. These guys were unreal . All the old guys went out fishing daily and diving for abalone while the ladies sat around knitting and chatting. Not only were they really friendly and a great laugh but they also kept us supplied with not only fish but also abalone. This was the first time we had tried abalone and at $125-00 a kilo in its shell most probably the last. And the verdict? Not bad, with a strong fishy taste. Why the Japanese pay so much for it leaves me a little bewildered. We have had a number of fish meals compliments of these guys. The incredibly generous people we have met in such a short time leaves me speechless. And no, I haven't been hovering around scabbing all this fish for those of you wondering, it has all been freely offered. 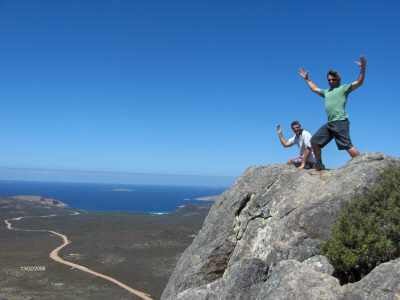 The surrounding area is very hilly with one very tall (262 metres) granite outcrop known as 'Frenchmans Peak'. We all climbed it (yes, including Chris) and the view from the top was worth the effort, being able to see almost the whole National Park. Our week here was spent on the beach, playing cricket on the beach, driving along the beach, swimming at the beach and paddling the kayak at the beach. A very beach orientated week in perfect sunshine. As you can see Chris is doing it tough, a good book, a sunny day and the perfect beach on which to do it. Like a pig in mud. You could easily spend a month here but unfortunately (or should that be fortunately) there are many other beautiful places yet to discover. Our next stop will be Esperance for a few days and then????. Now this is a really appealing seaside town. Yes, it is a little touristy, and a little cool even though it is the middle of summer, but regardless of that a very livable place. There are 5 caravan parks in town but we chose 'The Seafront Park' on the Stevens reccommendation. It is one of the few times he hasn't led us astray as this is a clean, well appointed park (you can even wash your car here). After a week free camping there is always a day's work washing and shopping. Not a lot of joy but you can't escape some jobs even on holidays. What we had planned as a 3-4 day stay stretched out to be a week. This is another town I could easily live in. The major down side would be the weather. The average summer temperature here is 25c with the winter average being 17c. The other issue is the wind. It has been good during our visit but it does get very windy often. I guess that is why sailing is very popular here. Other than those two minor points this is a great town of 14,000 people. 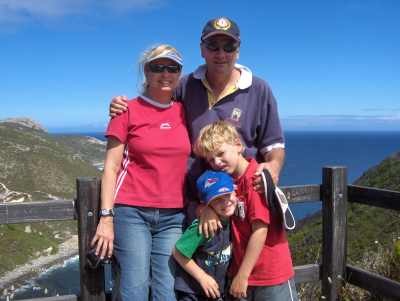 It has a lot in common with Port Lincoln with the magnificent rugged coastline and beautiful beaches. It's very hilly and therefore lots and lots of homes have great views over the many bays and beaches. The town is small but very well appointed with everything you could ever need. The street scape is very aesthetic with the streets lined with huge pine trees with the Southern Ocean as the backdrop. The "Recherce Archipelago"(Bay of Isles) consists of hundreds of islands, dozens of which can be seen from the shore around town. The fishing is very good and the main jetty in town even has it's own resident sea lions that hang around waiting for a feed of fish scraps. They kept us entertained for ages. There are 6 national parks all within 1/2 hour of town that are all uniquely individual, not to mention breathtaking. As there are no brothels in town I even dropped into the Post office to see if it was for sale. Not at the moment!! Maybe I could start the town's first brothel!! So how did we fill in the week. Domestic chores, washing and vaccuuming the car and installing a shovel holder on the car seemed to eat up a few days. A shovel holder I hear you say. Well I'm not sure what I am going to do with a shovel but every 4x4 has one so I guessed we needed one too!!! Then we did the 'Great Ocean drive" which is a 40km loop drive along the coast and past the wind generator farm. This was fascinating as they actually allow you to get up close and personal to them here which we haven't struck yet. You could actually touch it and walk around the base which was great to really appreciate their sheer size. We all laid on the ground looking up at the blades as they whooshed past (it was one of those 'you had to be there' experiences). There are 15 turbines in total all spread over the top of the hill. They are quieter than we expected and I certainly don't think they spoil the landscape, in fact in some sort of an artistic way actually add to it. The next day was the highlight of Harry's week as we went on the miniature steam train ride around one of the local parks. In fact he had a couple of rides and then they let him sit in the drivers seat. He will be talking about it for a week. After that we did a tour of the Port Loading Facility. This tour was excellent, went for 1 1/2 hours and cost us $10-00 for the family. Now this is a small town working together with industry. The 'Port Authority' stopped doing the tours a number of years ago due to a few reasons, public liability and security risk just a couple. To keep this tourist attraction going the Port Authority put a proposal to the local 'Apex Club'. The Port Authority would hire and pay for the bus and driver (no charge to the Apex Club) if the Apex Club supplied the tour guide. All money collected then goes to the Apex Club to support the local community. This has been running every Saturday and Sunday for the past 6 years, with I imagine a lot of money raised. There would have been 30 people on our tour. You don't see this level of community spirited industry cooperation very often. Good on them. So that is it for Esperance. Our expectation of WA has been far exceeded with what we have already seen. If the rest of this state is like this it will be a very exciting 6 months ahead of us. From here not sure of our next stop. We will make it up as we go along. We will definitely be stopping at Bremer Bay and possibly somewhere in between. Half the fun of being 'on the road' is not actually knowing your next stop. With this type of stress free existence a person could live to be 200 years old. Keep watching for the next update. I must say it was a bit sad leaving Esperance. For such a little town it has so much to offer. Shame about the weather being so cool even in summer. On the way to Bremer Bay we stopped in to a couple of little beaches. The first was Quagi Beach which was yet another lovely secluded beach with a nice free camp that had not only toilets but also showers. We had a good walk along the beach exploring all the rock pools. Alex did his 'Harry Butler' and saved a star fish from certain death by relocating it to a pond. He was so happy with himself. The next stop was Stokes Inlet National Park. It was only 5 kms off the main road on a very good dirt track. It was a really interesting place and well worth a visit. There are two camping areas only 1 km apart, both with toilets. The second camp ground near the mouth of the inlet is the nicest with the camp spots literally inches from the water. I think that at high tide some of the sites would be in the water. This would have been a nice spot to spend the night but it was still very early and we thought we best push on a little further. The drive from Esperance to Bremer Bay was very boring other than the two stops with absolutely nothing to look at except low salt scrub. We normally like to be off the road by 4-00pm at the latest because of the roos but made an exception as there was literally nowhere to stop. We would be in Bremer Bay by 5-30pm we thought. Well, about 10 kms out of town a huge roo jumped straight out in front of us. I jumped on the brakes as hard as I could worried about his mate that at this stage hadn't shown himself (why are they always in pairs??). All four caravan brakes locked up with a lot of smoke and screeching. The car also locked up and out came roo number 2. Luckily we narrowly missed him as well, but boy was it close. In future we will stick to our 4-00pm rule. The upside of the whole event was that it showed how quickly the car/ van combination can pull up in an emergency. I am really glad I installed the second set of brakes on the van prior to this trip. Well we did get to Bremer Bay at our expected 5-30pm. There are two caravan parks in town so we checked them out. This is a tiny town of only about 150 people with two great parks. We ended up staying at 'Fishery Beach Tourist Park" that we have all voted as the 'Best park of our trip' so far. First impressions are sensational. A magnificent reception area and miles of the greenest grass I have ever seen. It has three near new flexi pave tennis courts (free) and a lovely pool. The park is set in a bush setting , is hilly and the sites not at all uniform. They are spread out all over the place giving the feeling of privacy and spaciousness. The husband and wife team (Bruce and Louise) who own and run the park are extremely pleasant and well suited to the tourist industry. They are currently in the process of expanding the park and will be relocating the permanent vans into their own area. The amenities are clean and modern with a great camp kitchen overlooking the tennis courts. And all this for only $24-00 per night and they didn't charge for the kids. This is what caravan parks should be like. So far in WA we have found most parks to be more expensive than we are used to with most charging between $8-10 per child per night. Any wonder so many people free camp or stay in National Parks. If Bremer Bay was the biggest hole in Australia (which it certainly isn't) this park would still be a must visit. 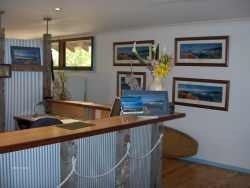 The fact that Bremer Bay is so lovely makes our stay here even more enjoyable. There are tonnes of park owners/ managers that should visit this place and take a leaf out of their book. What we had planned to be a 1 night stopover will end up being 3. That's what happens when you get good value for money. Our time here just seemed to disappear. Alex had us down at the tennis courts as often as he could, which was lots of fun. The kids rode their bikes and Chris and myself generally fluffed around, which is something we are getting really good at. This little council run camp ground is 18 km off the highway on a very average, corrugated dirt track. As with all the small bays around here it was also breathtakingly beautiful. The fact that the sun was shining and not a breath of wind of course only enhanced it's beauty. As we pulled in, the camp host (this is such a great idea and something that QLD really needs to look at in all camping grounds) met us and explained everything to us. 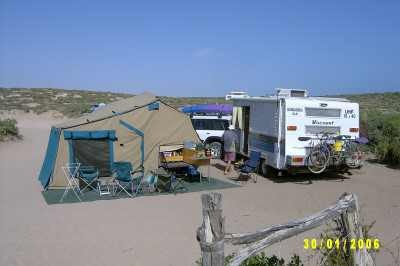 Council operated, $5-50 per night per campsite, flushing toilets, cold showers and generators allowed . Still this was only going to be a morning tea stop so down to the day area we drove. Sitting in the large covered area with free barbecues were two couples having the big cooked-up greasy breakfast. Boy it looked good. They came straight over and we chatted for ages. They are both from north of Perth. Well we hadn't even intended to stay when they had 'Happy Hour' already arranged, which of course left us with no option but to find a spot and stay at least the night. We spent the rest of the day on the beach exploring, swimming and playing in the sand. The down side of staying was that it was the weekend and the camp host informed us there is no phone reception in the camp ground, even CDMA. Bugger. This is our time to talk to family and friends and to find out what is happenning in the real world. I put up the phone aerial on the roof of the van, connected it to the phone and presto, reception. Everybody else in the camp were amazed to see us chatting on the phone, when they couldn't. We have found a number of places now where the phone won't work in the car but does when connected in the van. As the aerials are identical it can only be the height that is making the difference. We are glad that I installed that aerial just before we left. Believe it or not getting calls from family and friends is still the highlight of our week. Thanks! It seemed that 5-00pm came around very quickly so off to happy hour. We had a great time chatting and finding out all sorts of local information. 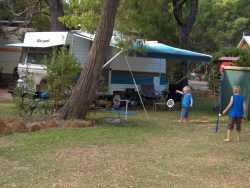 It has certainly been our experience so far that people are much more friendly and social in free camps compared to caravan parks. I am not sure why this is but will put a lot of thought into this anomaly over the next few months. One of the couples we had drinks with has acreage north of Perth and offered us a spot in their paddock as an overnighter on our way through. Where else can you meet people once and be invited to stay with them. The people you meet is amazing. We really needed to get moving as the month is getting away from us, so the next morning we packed up and moved on. This was made easier by the fact that it was windy and a bit miserable. Next stop Albany. This is another place I have been looking forward to seeing because a lot of people have told us that if we liked Esperance we would love Albany. 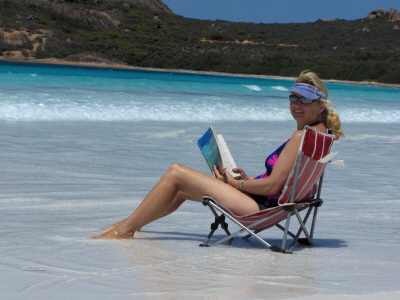 As you have read previously we thought Esperance was good enough to live in so Albany should be out of this world. There are are about 10 caravan parks in this city (30,000 people) so we picked 4-5 to check out. The first few were very average and very expensive. You could get a better deal in the Kalgoorlie brothel. Not to be beaten we kept looking and finally settled on one at Emu Point called 'Rose Garden Chalet and Tourist Park' (not sure why as haven't seen any roses!?!?). It's an average park on the beach, close to town with good hot showers with excellent water pressure (yep, that's about all the good points) and is only $23-00/ night. Compare that to the Big 4 at Middleton Beach (which is very flash) at $39-00/ night and we were happy. Albany has some similarities to Esperance with the main street looking over the ocean and surrounded by dozens of small secluded bays, but have to say the family opinion is that Esperance is still No 1, probably due to the fact that it is half the size of Albany and therefore a little more quaint. We plan to spend about a week here and have to take into account that next weekend is a long weekend (labour day). This could make getting into some places near the coast a bit difficult. It was expected that in the next few days we might get a bit of wet weather due to the cyclone up on the WA coast so we decided to do the touristy things straight away. The first was 'Whale World'. This was an actual whaling station and the last one in Australia to close in 1978. This is an extremely good educational attraction that we spent 5 hours exploring. There are three small cinemas, one with a great 3D movie. The guided tour is incredible. As they take you out onto the flensing deck (where they cut up the whales) an outside surround sound audio made you feel like you were actually there in 1975. You hear all the machines and men calling out and talking, compliments of about 6 big strategically placed speakers. The audio walked you through the very gruesome process step by step. It is interesting that an accepted practice only 30 years ago is now considered so cruel and barbaric. We were a little worried that it might be a bit upsetting for the boys and while parts were, it was tastefully done. Alex did get a little annoyed at the fact that the Japanese continue this whale slaughtering practice and to quote Alex "People were so stupid" in the olden days to have done this to such beautiful animals. It took ages explaining that things have been done in the past not because of stupidity but because we didn't know any better at the time. He had a bit of trouble understanding that people could not see that killing a gentle, harmless creature like a whale could have been considered OK. He does have a point. I think he will be the sensitive soul in this family. A greenie at age 8 years. The next day I spent doing boy things. I felt the need to do a few modifications (to avoid any withdrawals) and felt this was necessary for the continued success of the trip. The goal was to purchase and install a storage box on the roof of the car. This way we can move some of the larger bulky items (like the new snorkeling sets) out of the car and up on the roof. Of course this subject needed to be well researched prior to any purchases. You will be glad to know that with the help of a local aluminium fabricator, Wayne (Albany Aluminum) the new storage box is up, as well as a second box which will house the second gas bottle and surely something else! This is so typical of country town hospitality. Alex and I went back to collect a few more short lengths of aluminium. Wayne took Alex out into the workshop to show him his son's electric Jeep ( all aluminium of course) that he had made. It has very sophisticated electronics (unlike the real Jeep!!!) with variable speed forward and reverse throttle and plenty of other features. He kindly let Alex drive it up and down and around and around the car park. Alex had a ball and hasn't stopped talking about it. I have said it before and I am sure I will say it again, this world is full of very kind people. The following day we visited a few more sights including the blow holes, natural bridge, the gap and numerous other beaches. It was a great day full of walks and dolphins. At two separate beaches we saw large pods (of up to 30 dolphins) working as a team to round up most likely salmon and then having a good feed. It was a very impressive sight and not one we have seen before. A couple more days with a mix of relaxing and a few drives finished off our stay in Albany. We all very much enjoyed our time here but as per usual are excited about our next adventure. Luckily we didn't end up getting any unpleasant weather accociated with the cyclone that we expected. From here it is a big 50km drive to Denmark. We hope to be in the Margaret River area in about 2 weeks. Well another month slips by and boy have we seen some sights. The beginning of this month saw us crossing the Nullarbor and the end will see us leaving Albany. So many adventures lie ahead. We have had excellent weather with mainly clear skies and sunny days. The temperature has been a little cooler than we are used to but has been very comfortable for sightseeing. We have also experienced only a handful of windy days (and boy can it blow) but luckily 98% of our days have been wind free. 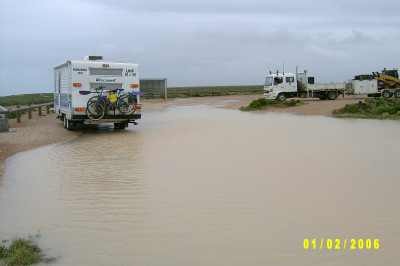 As for rain we have seen none since leaving the Nullarbor. If you are planning to see the bottom corner of WA, January, February and March are most definitely the months to visit. 3/Average fuel economy = 17.3 litres/100kms. 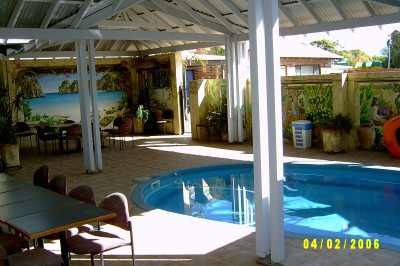 We continue to spend less on accommodation than expected and are currently $1120-00 under budget (average $155-00/ week). We are also spending less on diesel than budgeted and are currently $970-00 under budget (average of $166-00/ week). Our living/sightseeing/grocery expenses are spot on at $350-00/week. We expect to be spending more on fuel as we head further north as fuel prices increase and distances also increase. Car and van travelling well with no problems to date. Life on the road is great. We couldn't be happier. Well that is it for February 2006. We hope you are all well..
Stay tuned for some March madness. Until then! "Our lives are not determined by what happens to us but by how we react to what happens, not by what life brings to us, but by the attitude we bring to life. A positive attitude causes a chain reaction of positive thoughts, events, and outcomes. It is a catalyst, a spark that creates extraordinary results".